Tiny robots no bigger than a cell could be mass-produced using a new method developed by researchers at MIT. The microscopic devices, which the team calls "syncells" (short for synthetic cells), might eventually be used to monitor conditions inside an oil or gas pipeline, or to search out disease while floating through the bloodstream. 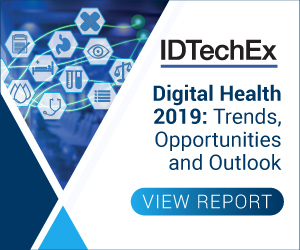 For more information see the IDTechEx report on New Robotics and Drones 2018-2038. The novel process, called "autoperforation," is described in a paper published today in the journal Nature Materials, by MIT Professor Michael Strano, postdoc Pingwei Liu, graduate student Albert Liu, and eight others at MIT. The system uses a two-dimensional form of carbon called graphene, which forms the outer structure of the tiny syncells. One layer of the material is laid down on a surface, then tiny dots of a polymer material, containing the electronics for the devices, are deposited by a sophisticated laboratory version of an inkjet printer. Then, a second layer of graphene is laid on top. People think of graphene, an ultrathin but extremely strong material, as being "floppy," but it is actually brittle, Strano explains. But rather than considering that brittleness a problem, the team figured out that it could be used to their advantage. "We discovered that you can use the brittleness," says Strano, who is the Carbon P. Dubbs Professor of Chemical Engineering at MIT. "It's counterintuitive. Before this work, if you told me you could fracture a material to control its shape at the nanoscale, I would have been incredulous." But the new system does just that. It controls the fracturing process so that rather than generating random shards of material, like the remains of a broken window, it produces pieces of uniform shape and size. "What we discovered is that you can impose a strain field to cause the fracture to be guided, and you can use that for controlled fabrication," Strano says. When the top layer of graphene is placed over the array of polymer dots, which form round pillar shapes, the places where the graphene drapes over the round edges of the pillars form lines of high strain in the material. As Albert Liu describes it, "imagine a tablecloth falling slowly down onto the surface of a circular table. One can very easily visualize the developing circular strain toward the table edges, and that's very much analogous to what happens when a flat sheet of graphene folds around these printed polymer pillars." As a result, the fractures are concentrated right along those boundaries, Strano says. "And then something pretty amazing happens: The graphene will completely fracture, but the fracture will be guided around the periphery of the pillar." The result is a neat, round piece of graphene that looks as if it had been cleanly cut out by a microscopic hole punch. Because there are two layers of graphene, above and below the polymer pillars, the two resulting disks adhere at their edges to form something like a tiny pita bread pocket, with the polymer sealed inside. "And the advantage here is that this is essentially a single step," in contrast to many complex clean-room steps needed by other processes to try to make microscopic robotic devices, Strano says. The researchers have also shown that other two-dimensional materials in addition to graphene, such as molybdenum disulfide and hexagonal boronitride, work just as well. Ranging in size from that of a human red blood cell, about 10 micrometers across, up to about 10 times that size, these tiny objects "start to look and behave like a living biological cell. In fact, under a microscope, you could probably convince most people that it is a cell," Strano says. Apart from the syncells' potential uses for industrial or biomedical monitoring, the way the tiny devices are made is itself an innovation with great potential, according to Albert Liu. "This general procedure of using controlled fracture as a production method can be extended across many length scales," he says. "(It could potentially be used with) essentially any 2-D materials of choice, in principle allowing future researchers to tailor these atomically thin surfaces into any desired shape or form for applications in other disciplines." This is, Albert Liu says, "one of the only ways available right now to produce stand-alone integrated microelectronics on a large scale" that can function as independent, free-floating devices. Depending on the nature of the electronics inside, the devices could be provided with capabilities for movement, detection of various chemicals or other parameters, and memory storage. There are a wide range of potential new applications for such cell-sized robotic devices, says Strano. As a demonstration, the team "wrote" the letters M, I, and T into a memory array within a syncell, which stores the information as varying levels of electrical conductivity. This information can then be "read" using an electrical probe, showing that the material can function as a form of electronic memory into which data can be written, read, and erased at will. It can also retain the data without the need for power, allowing information to be collected at a later time. The researchers have demonstrated that the particles are stable over a period of months even when floating around in water, which is a harsh solvent for electronics, according to Strano. "I think it opens up a whole new toolkit for micro- and nanofabrication," he says. Daniel Goldman, a professor of physics at Georgia Tech, who was not involved with this work, says, "The techniques developed by Professor Strano's group have the potential to create microscale intelligent devices that can accomplish tasks together that no single particle can accomplish alone." In addition to Strano, Pingwei Liu, who is now at Zhejiang University in China, and Albert Liu, a graduate student in the Strano lab, the team included MIT graduate student Jing Fan Yang, postdocs Daichi Kozawa, Juyao Dong, and Volodomyr Koman, Youngwoo Son PhD '16, research affiliate Min Hao Wong, and Dartmouth College student Max Saccone and visiting scholar Song Wang. The work was supported by the Air Force Office of Scientific Research, and the Army Research Office through MIT's Institute for Soldier Nanotechnologies.